We understand from our Colombian friend Juan Camilo (who longtime readers may remember from this podcast) that the Bogota nightlife is on a par with any of the world’s party capitals, and that when it comes to late night boozing, the aguardiente-loving natives of Colombia’s capital are among the most experienced. It should come as no surprise then that they have also spent some time figuring out effective cures to the inevitable DT’s the morning after — something that I am sure Charlie Sheen, with his well-known enthusiasm for the odd briefcase of Colombia’s most famous export, already knows about. Across South America, hangover cures tend towards the liquid — Peru’s famous leche de tigre (“tiger’s milk”, the citrusy liquor leftover from ceviche preparation) and the shrimp and coconut milk stews of Brazil — and are more similar to chicken soup as a cure-all than the meat and starch heavy plates bleary-eyed North Americans and Brits swear by. 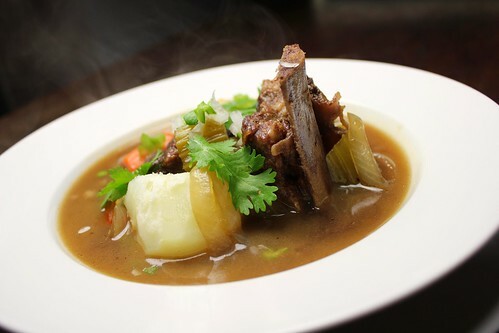 In caldo de costilla, Colombians have a dish that may well raise the dead as easily as cure the hungover. 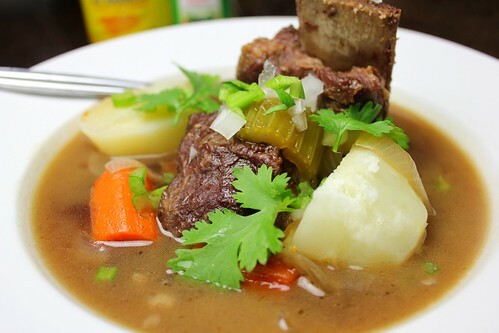 An intense beefy broth surrounding hunks of braised short ribs and root vegetables, and garnished with lime juice, chopped onions and, occasionally, aji (a spicy vinegary condiment), it restores dehydrated cells, fills the growling belly, and enlivens the palate in one fell swoop. As a devoted family man himself, Charlie Sheen might appreciate the nutritive value of such a soup on a weeknight as much as after a 7-day Vegas bender, and indeed, such were the circumstances of our own enjoyment of it recently (the former, not the latter). Worn thin by the fearsome demands of work and family, this soup helped us pull body and soul together on a Monday night and gird ourselves for another grinding week. We may not have leaped out of bed the next morning, but that had more to do with us not having been on a drug called Charlie Sheen than anything attributable to the soup. In a pressure cooker or large pot, heat oil to medium high and brown short ribs will on all sides, making sure to get a good color on the bones too. Toss in carrots, celery and onion, and pour in beef broth. Allow to simmer for at least two hours (or if using a pressure cooker, 35minutes will do) or until short ribs are fall apart tender. In another pot, bring abundant salted water to the boil and add potatoes. Boil until tender, about 12 minutes, and then drain and reserve. Rinse the finely diced onion under cold water for a minute or so to remove its tanginess, and drain. When soup is ready, serve in large bowls with reserved potato and garnished with diced onion, chopped cilantro and lime wedges. Hangover optional. Yeah, I’ll take meat and potatoes over ceviche slurry as a hangover cure any day. You know what makes Charlie Sheen such a great dad? Everything. @Heather – I love the man. I mean I hate him, but he is so awesome. I thought I’d take a reprieve from the 24/7 Charlie Sheen loop and read some food blogs. Alas, it was not to be. 🙂 Though I must say, CS would probably benefit from a bowl or two of your restorative caldo. 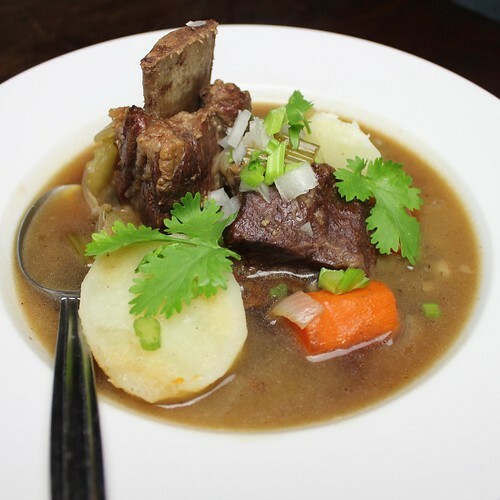 It really looks delicious – I love the idea of the short ribs, but I think the medicinal boost comes from the aji and fresh lime juice. It’s a good thing you didn’t try that drug or your faces would have melted off. I think he’s accomplished something pretty profound, though, which nobody else could ever have accomplished: he’s actually made the world nostalgic for Emilio Estevez (who probably eats this all the time, seasoned with bitter, salty tears). @Debi – boom, boom! That’s awesome. There are just so many puns and jokes to be made out of him and his ravings, and hopefully, there are more to come right here. Greetings Never-Fullers… I forgot to mention in my original intervention that Cositas Ricas is (miraculously) open 24/7. Oh poor Charlie… from what I hear… a cocaine hangover is a killer… this soup would take care of that I am sure. Love the idea of a beefy broth with lime… that must be the secret. It makes me feel warmer already! You really can’t go wrong with beef short ribs. I am always amazed at how so many recipes can try all sorts of flavor profiles with them and they always look delicious. Cure hangovers? Why not? What can’t they cure? Not sure if I could handle an aguardiente hangover. I only drank that stuff once (at my brother’s wedding) and one shot was enough! Charlie Sheen could probably handle it, but that’s only because his brain and liver are too pickled ot know the difference. So how many times in his 40-something years has he been in rehab and cleaned up now? I should make a big batch for my son 🙂 That looks delicious. beef stew for breakfast sounds awesome, especially topped with chilies, lime juice and raw onions! Cauldo de costia de res was also available for breakfast at Bogota’s main market. Café con leche o chocolate and the cauldo. The vendors ate this (and so did my wife and I) and those who didn’t had café and a shot of aguardiente instead. Living in Bogota for three years, my wife and I looked forward to our weekly trips to the market: for the produce, for the breakfasts and for the wonderful people we met. WE may have been the only gringos out there since we drew attention, but for me, the time spent at the market were the best ever.